I added some cream to act as a background for the colours, then decided to add some sashing and managed to match up the blue in a plain fabric. I just had enough Gypsy scraps left to make a multi-coloured strip which I will use for the binding. 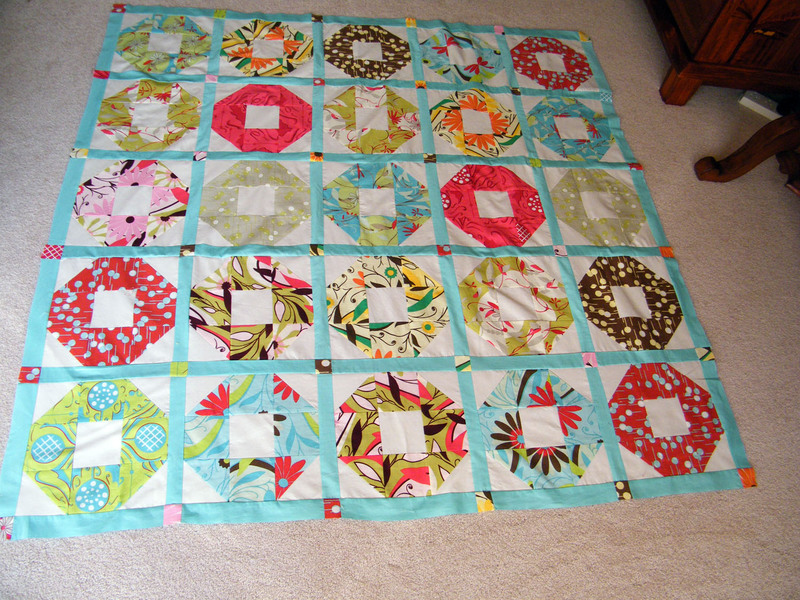 Now I am seriously considering stitching the binding to the border before I add the batting and backing. I would certainly do a better job with a more accurate 1/4" seam than I do when sewing through all thicknesses. As yet I haven't been able to think of any reason why it wouldn't work doing it that way Sew it now, then do the quilting, finally trim and handsew the back. All that's needed is a smart little holiday house down on the coast which would be the perfect setting for this quilt. It looks fantastic. I love the pattern you chose for the fabrics. Your top looks great, I like the cream added. It compliments the business of the fabrics. Haven't tried adding the bindings before quilting but how will you finish the corners? I'm obviously going to have to give this some more thought !